Kim Kiyoung’s Vacancy(2017) is a sculpture presenting an irreversible situation in which an action of sharpening deprives a common chair of its original function whereas it still maintains its appearance. 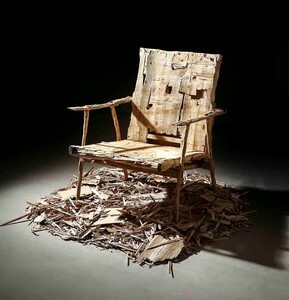 The chair in its minimum shape addresses serious questions: whether lack of an industrial product’s function means a denial of its value of existence when its effective value is equivalent to its existential worth: whether the chair’s ideational status which is its conceptual prototype can be preserved in this condition. Kim was majoring in Sculpture in Chungbuk National University, Cheongju, Korea and received the Doctor’s degree from Kyoto City University of Arts, Kyoto.